This dough is very flavorful and versatile; you can use it for loaves baked in loaf pans, buns baked on sheet pans, tea buns made in muffin pans, cinnamon buns made in giant muffin pans, or cinnamon rolls baked on sheet pans or in 10" x 10" (25 cm x 25 cm) square pans. Loaves can be baked the same day, but if making any type of bun, you need cold dough in order to shape them, so plan on making the dough the day before and refrigerating overnight. I prefer to refrigerate dough for loaves as well. 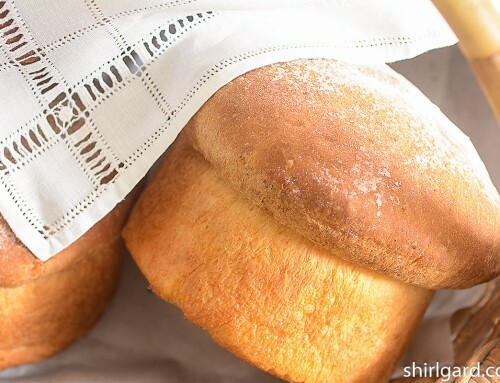 —The yeast that I use for this recipe is SAF Gold Label Instant Yeast, available on-line, which is a yeast designed especially to be used in sweet doughs that contain rich ingredients such as milk or cream, eggs, and butter. If you choose to use a different yeast, the rising times may be a little longer than what I give here. 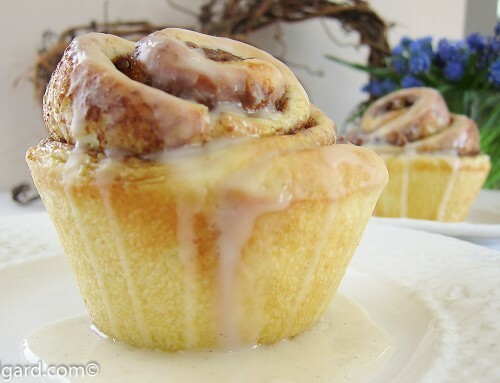 —Sally Lunn has a fun and interesting history; see my post Sally Lunn Buns. The recipe in that post is slightly different from this one, in that it uses just heavy cream instead of half & half and butter, but I like and use them both. HEAT half & half cream and butter in a large 4-cup glass measuring cup in microwave until the butter is melted and the temperature reaches 180° F (82° C). This will take about 3 minutes; do 2 minutes first, check temperature, then do 1 more minute if needed. Or, heat cream and butter in a small saucepan on the stove. Let cool to lukewarm: 80° - 85° F (26° - 29° C). DO THIS FIRST so it has time to cool. ADD eggs and whisk until well blended and smooth. SCALE the dry ingredients directly into Kitchen Aid (or other stand mixer) bowl. Mix on lowest speed, using the paddle, until well mixed. POUR in the liquid ingredients with mixer running on low speed until batter comes together. BEAT on medium speed (Between 4 and 5) for 3 minutes. SPRAY a large bowl with Pam or other non-stick spray. TRANSFER batter to the greased bowl. Cover with plastic wrap that has also been sprayed with Pam. PUNCH DOWN, re-wrap tightly, and refrigerate overnight. This is called "retarding" the dough. Note: the dough will continue to rise in the refrigerator until it is completely cold, so it may be necessary to punch it down more than once. CHECK it before you go to bed to make sure it is not over-flowing the bowl. Punch down one more time if necessary. USE the dough within two days. Adapted from The Fanny Farmer Baking Book by Marion Cunningham(1984). Do you have a recipe for Tarte de St Tropez. I’ve purchased the yeast you suggested – hoping I can pull this recipe together successfully and use it for the base but really – I’d like one good, reliable recipe for Tarte de St. Tropez. Do you have this is your repertoire? Thanks for your time and effort putting together shirlgard blog and in this request any help is appreciated. The recipe that I would recommend for St. Tropez Tart (Tarte Tropézienne) is by Dorie Greenspan. She worked on several cookbooks with the French pastry chef, Pierre Hermé and I have used many recipes from both Dorie Greenspan and Pierre Hermé. I trust that their recipes will work. The St. Tropez Tart is basically a Brioche cake, split into two layers and filled with a creamy filling of pastry cream. I hope you love the SAF instant yeast as much as I do. It will keep a long time if you keep it in the freezer. Good luck with the tart. It sounds yummy.